Where to find a sleigh ride or winter hay ride in your area! There's nothing like a sleigh ride on a cold winter day! Whether you are going for a midwinter activity in January, February or March, or going in December to pick a Christmas tree, cut your own tree, get one already cut, or just want a fun and romantic sleigh ride or horse-drawn hayride; here's the complete list of where to find sleighrides. If I've missed farms or stables offering sleigh rides, please write me to suggest them! Many of the sleigh and winter hay rides are offered by Christmas tree farms that have cut-your-own trees, precut or you-choose-and-they-cut trees, but just as many are offered by stables that operate sleigh rides throughout the winter (and carriage ride, hayrides and horse riding in the other months). Except in very cold northern or mountainous area, sleigh rides are usually catch-as-catch can, meaning you must call in advance to reserve a spot on a list. Then IF there is a sufficient snowfall, they will call you back and ask if you want to go. Also keep in mind that due to the absence of snow, many more farms offer wagon rides and hayrides. So if you can't find a sleigh ride in your area, don't despair, try a hay ride instead; you can find them in almost every area! If you want a hayride or wagon ride instead, click here to find one near you! the availability on the date and time that you want. Click on the blue links below, of the area closest to you. Then just scroll down the page and look for the yellow highlighted "sleigh rides". I've indicated the number of farms/stables below! Also see this section for sleigh riding tips ! There are a half dozen in Arizona. See this page. 10009 Lilja Road, Harvard, IL 60033. Phone: 815-600-8066. Email: contact@gosleigh.com. Open: Call for reservations; Open for sleigh rides throughout the winter season; Visit GoSleigh.com for latest hours and sleigh ride availability. Click here for current open hours, days and dates. Directions: We're approximately 35 minutes east of Rockford, or 1 hour northwest of O'Hare airport. Click here for a map and directions. Payment: Cash, Check, Visa/MasterCard, Discover, AmEx. Click here for our Facebook page. Join GoSleigh.com Countryside Christmas for a day of snow packed fun! 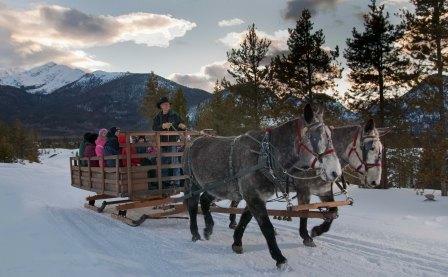 Affordable luxury sleigh rides and more! Visit GoSleigh.com for details. 14118 Peach Road, Plymouth, IN 46563. Phone: 574-936-9262. Open: Reserved hayrides available anytime,Spring through fall, call! Sleigh rides are weekends, 1 pm to 3 pm. Directions: Click here for a map and directions. Open for sleigh rides December through February weather permitting; Call first. We follow organic practices, but are not seeking certification. Payment: Cash, only. We are "Certified Naturally Grown", a farmer's organization for organically grown farm products. Click here for our Facebook page. 1275 Smith Road, Bourbon, MO 65441. Phone: 573-732-4590. Email: tanyaschoenbeck@gmail.com. Open: Year Round. Directions: See their website for directions. Payment: Cash, Check . Please check the website for more info. RS Ranch is an actual working guest ranch. They have trail rides, horse drawn hay and sleigh rides, and other activities. They use Missouri Foxtrotters for the trail rides and have Percherons for the hay wagon and sleigh. Not to mention a BEAUTIFUL location in the Ozarks of Missouri. Located just 1 hour from St. Louis's Lambert International Airport, you drive southwest thru beautiful country with rolling hills and interesting stops that might include wineries, cave tours, or one of many antique shops. Upon your arrival we will help you design a cowboy getaway that is just right. You have many trail riding options, plus roping, horse-drawn hayrides or sleigh rides in the winter. If you want to learn some horsemanship then just watch or help with some of the day to day horse work that it takes to keep a cowboy ranch going. From shoeing, to harnessing a draft team or maybe training a young colt, there's always lots to do. Comments from a visitor on January 04, 2014: "Cannot tell you enough how awesome this place is. WONDERFUL people that own/run it. Roy and Tanya Schoenbeck are superb hosts! BEAUTIFUL"
9200 Tule Springs, Las Vegas, NV 89135. Phone: 702-596-6715. Email: sdistler@aol.com. Open: Sleigh rides are Monday to Saturday from 4 pm to 9 pm Reservations Required (702)596 to 6715. Click here for current open hours, days and dates. Directions: 95N to Durango turn right (North) to Brent Road Turn Right into Floyd Lamb Park. Click here for a map and directions. Payment: Cash, Check, Debit cards, Visa/MasterCard, Discover. The RANCH also offers Camps, Birthday Parties, Special Events, Petting Barn and Santa's Holiday Barn and Sleigh Ride. 216 Pleasant Street, Epping, NH 03042. Phone: 603-679-4373. Email: ledgewoodbelgianfarm@comcast.net. Open: Horsedrawn Hay and Sleigh Rides by reservations. Click here for current open hours, days and dates. Directions: Click here for a map and directions. Horsedrawn Hay and Sleigh Rides by reservations throughout the year; Bonfires included; Book your Holiday rides now;. Payment: Cash, only. 18161 Highway 4, Jemez Springs, NM 87025. Phone: (866) 382-5537. Email: recreation@vallescaldera.gov . Open: Monday to Friday 8 - 5 MST, Saturday from 9 am to 5 pm MST. Directions: The main gate to the Preserve will be open during business hours and is located at mile marker 39.2 along State Highway 4, 18 miles west of Los Alamos or 20 miles East of Jemez Springs. Proceed through the main gate and down the snow packed road approximately 2 miles to the Valle Grande staging area. You will be directed on where to park. You will board a van from here to take you to the sleigh/wagon. The Valle Grande staging area is located approximately two miles inside the Preserve along a north facing, often snow packed and icy unpaved road. We will plow road when weather permits but four wheel drive and/or chains are recommended and may at times be required. On windy days drifting snow can make the road sometimes impassable, even if it has recently been plowed. Click here for a map and directions . Matched draft horses take you through the historical ranch headquarters. From aboard the 60-minute ride, you'll experience a winter wonderland with possible visions of hunting birds and jumping coyotes. A guide will share the interesting history and lore of the "old Baca Ranch," offering you insight into its past and its future. With the deeper snows of winter, the horses will be hitched to a large horse-drawn sleigh for an experience you'll long savor. (Note: When snow is not sufficient, a horse-drawn wagon will be used instead of the sleigh.) Horse-drawn tours are a great alternative for those who are seeking an outdoor experience of a shorter duration and with less exertion than hiking or skiing. Winter 2010/2011 Fees: Adults $30, Seniors 62-and-over $24, Children 15-and-under $15, Children $ Free (Age 5-and-under). Reservations are not required, but are strongly encouraged due to the limited season and popularity of the rides. We will accept walk-ins on the day of the ride ONLY if there are seats available. Our sleigh comfortably holds 12 adults. Special arrangements may be made for large groups or additional dates or times by contacting us via email with your request including dates, numbers of participants, and expectations. 12067 Nice Road, Akron, NY 14001. Phone: 716-542-5767. Email: dan@wnyhorsedrawn.com. Open: We are available Monday thru Monday seven days a week. Click here for current open hours, days and dates. Directions: 12067 Nice Road, Akron, NY 14001. Click here for a map and directions. Call to schedule any event;. Payment: Cash, Check. We specialize in Weddings, Parades and Corporate events. We also have hay rides, and sleigh rides for parties at your location or ours. 2830 Wilmington Road, Lake Placid, NY 12946. Phone: 518-834-9933. Email: equinecntr@aol.com. Open: Winter Sleigh Rides: Open seven days a week, from 12 pm to 9 pm; Other horse activities including horseback riding: Oprn seven days a week, from 10 am to 5 pm. Directions: Click here for a map and directions. Payment: Cash, Check, Debit cards, Visa/MasterCard. Click here for our Facebook page. We offer sleigh rides at Adirondack Lake Clear Lodge and Retreat in Lake Clear, NY. Group ride is 30 minutes long through the woods on a lantern lit trail and we also offer a private ride on a small cutter which is a 45 minute ride. Hot cocoa is served with both rides. Dinner is also available at The Lodge. The Gideon Putnam, Gideon Putnam Road, Saratoga Springs, NY 12866. Phone: (518) 321-5539. Alternate Phone: (518) 584-3000. Email: atimetoremember4u@yahoo.com. Open: Fridays, Saturdays (4:00 pm to 9:00 pm) Sundays (10 am to 4:00 pm). Directions: Click here for a map and directions. Payment: Cash, only. Book now for Christmas, New Years and Valentines. Horse-drawn sleigh/wagon rides with or without snow (wheels on sleigh) The rides are not conducted on my physical property--They are conducted at The Saratoga Springs New York State Park. I conduct the rides on the roadways within the park and we depart from: The Gideon Putnam, Gideon Putnam Road, Saratoga Springs, New York 12866. 3100 Junction Road, Ashland, WI 54806. Phone: 715-682-4963. Alternate Phone: 715-292-2252. Email: pat@northwoodscarriage.com. Open: Carriage rides, wagon rides, sleigh rides by reservation only. Directions: Click here for a map and directions. Payment: Cash, Check. RR 4, Lakefield, Ontario K0L 2H0. Phone: 705-755-1081. Alternate phone: 705-755-0519. Email: merrylynd@peterboro.net . Merrylynd Farm is a certified organic family farm just outside of Peterborough, Ontario, Canada. During the winter months, we love to hook up our beautiful Belgian horses and take folks for long horse-drawn sleighrides through the rolling hills of our 100 acre property. There's skating, toboganning, hot chocolate from an iron kettle over an open fire, and much more. Or come in the Fall to visit Kara and Kirsten's pumpkin patch, where you can choose your very own organic pumpkin. We also sell organic beef, flour, and natural chicken from the farm gate. 687 Street John's Road East, Port Dover, ON N0A1N2. Phone: 519-426-2155. Email: evergreenhillfarm@gmail.com. Open: We are available 365 days a year, weather permitting for sleigh rides; From 8 am until 10 pm. Click here for current open hours, days and dates. Directions: Please come visit us at the farm! We are located at 687 Street John's Road East between Port Dover and Simcoe Ontario. Click here for a map and directions. Payment: Cash, Cheque. Click here for our Facebook page. We at Evergreen Hill Farm offer year round entertainment with our beautiful Belgian Draft horses. We offer Hay rides throughout the summer and fall and Sleigh Rides, weather permitting. We also offer Maple Syrup and Sugar Bush Tours in the Spring Season. We have something for all your Horse Drawn carriage needs, Horse-drawn hearse, stage coach, wedding carriage, Victorian sleigh. Please visit our website. Thank YOU. 924 Fort Augustus Road, Bunbury, PEI, Canada. Phone: 902-894-7558. Email: gnadventures@hotmail.com. Directions: from the Confederation Bridge: (Follow the TransCanada Highway all the way into Charlottetown) 1. Turn left on to Upton Rd (once you pass Cows it is your next left) 2. Turn right on to the Charlottetown Bypass (3rd right on Upton Rd) 3. Follow the Charlottetown Bypass through approximately seven sets of light. 4. Turn left on to the Hillsborough Bridge (there is a Tim Hortons on your right) 5. Take your first exit off the bridge on your left (if you go through a set of lights, you've gone too far.) 6. Follow the Bunbury Rd until you come to a stop sign 7. Turn left at the stop sign on to the Fort Augustus Rd 8 We are the 4th driveway on the RIGHT. There is a large sign! We offer a romantic sleigh or wagon rides for two through our beautiful snow covered woods, bundled up with blankets then come back to our rustic heated cabin for a homemade dessert by candlelight and go to the petting pen to see all the animals. We offer this any day/any time of the week. And in February, a special anniversary or just for Valentines Day? Want a fun way to propose to your loved one??? We are also available for proms and weddings! Dress in old clothes and hiking boots or old athletic shoes; you want to be comfortable and not worried about staining or tearing your clothes! If the ground is wet, it will really ruin any nice shoe, so wear your beat up old ones! Bring heavy gloves to protect your hands and a jacket or other garment to protect your arms. Bring layered clothing, and some extra socks and a blanket. Dress for the weather. The kids may get wet feet, or cold. When you get back to the car, you can wrap them up in the blanket and they'll sleep all the way home! The weather could change without notice. If you get hit by a downpour (presuming it's not cold enough for snow), be ready to switch to Plan B and if you can't wait it out, go to the backup plan; such as a visit to a museum, tourist or historic site nearby. Your kids will remember it as "the time we went to cut a Christmas tree and instead had fun doing" something else. Pack snacks. You'll be gone for a while and all that being outdoors will work up a big appetite! Bring a cooler and back it with your favorite snacks; hot chocolate or warm apple cider are great. Many farms supply free cider, coffee and hot chocolate; some have lunches and snack for sale.